For the mechanical system shown on the diagram, determine the natural oscillation frequency. The mechanical system shown in the diagram at the equilibrium position can make free oscillations by rotating around the horizontal axis z passing through the fixed point O. The system consists of rigidly fastened together bodies: thin homogeneous rods 1 and 2 or a homogeneous plate 3 and a point load 4. The mass of 1 m of the rod length is 25 kg, the mass of 1 m2 of the plate area is 50 kg, the weight of the point load is 20 kg. 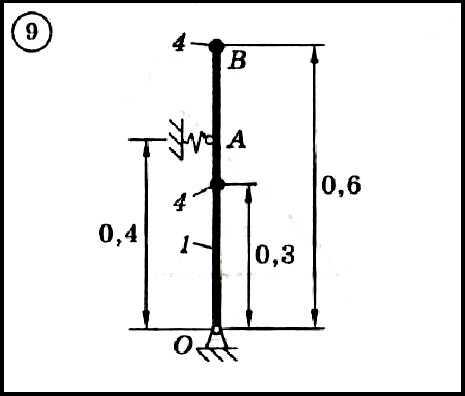 The elastic elements have a stiffness coefficient c = 10 kN / m. The dimensions of the system parts are indicated in meters.